Ever wondered about those Ribbons and how they are won at the Fair? Each year we publish books that list the categories rules and prizes, we call them "Prizebooks"
Did you know you can enter in the fair? Have you got a hobby or a skill? Do you grow vegetables in a garden? Paint? Craft? take photos? Can you cook? Bake? or... see our Homecraft prize book for more details. Or are you a hobby farmer and have a hen, or other farm yard animal. Or why not start young and get involved with 4-H? (you don't have to live on a farm to join) read below to find out more and Go visit the exhibits, competitions and showings! Homecrafts are household arts & handcrafts that are usually made at home. These range from woodworking, handmade jewery, creative items, paintings, baking, canning, sewing, quilting and more! 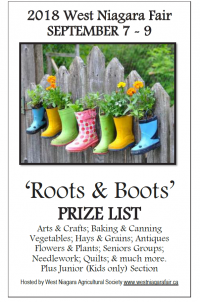 The prize book provides a list of competitions and prizes and cash to be won! Anyone can enter. But entry must be made before the fair! Come to the Community Centre to see them on display! Friday & Saturday 9am-9pm and Sunday 9am-5pm. 4-H is one of Canada’s longest running youth organizations for young people. It is a grassroots organization,emphasizing the importance of youth seeing beyond themselves and focus on how their actions affect their relationships, their community, the environment and society as a whole. Did you know you are between the ages of 9 and 21, you can join a 4-H club? Come to the fair and meet youth in the program and find out more!